The lacy, gleaming white spires of its 13th-century Gothic Cathedral dominate the riverside city of Burgos and stand out as its most beautiful landmark. Burgos is halfway on the gourmet route between Ribera del Duero and La Rioja wine regions in Spain. The city is also a major stopping point on the “Saint James Pilgrimage”, an ancient Christian pilgrimage that has various routes beginning in France, Austria and the UK, which all finish in the glorious Spanish city of Santiago de Compostela. 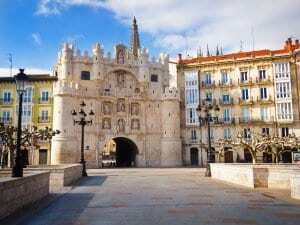 One of the grand dames of Castilla y León, the largely rural area that lies immediately northwest of Madrid, Burgos is an elegant, refined city whose often tumultuous history dates to 884. Known for its imposing Gothic monuments and powerful role in Spanish history, Burgos is a favorite destination for lovers of art, architecture, and history. Its rich culinary tradition makes Burgos a wonderful place for food and wine lovers as well. When Burgos was founded by the king of León in the 9th century, it was meant to be a northern stronghold of the growing Christian empire that would eventually become Spain. A few centuries later the city became the capital of the powerful kingdom of Castilla y León, a title it held until the more southern city of Valladolid became capital after the reconquest finalized in 1492. Still, as an important stop on both the Camino de Santiago (St. James pilgrimage route) and on the Madrid-France road, Burgos never lost relevance. During the Spanish Civil War, it was bestowed with the dubious honor of being declared the headquarters for General Franco’s fascist troops. With its grand riverside promenades, character-filled old quarter, and an outstanding collection of churches and monasteries, modern-day Burgos offers plenty to keep you busy. Begin a visit to the old city by crossing the Santa María bridge and passing through the ornate Arco de Santa María, a gate adorned with so many towers and turrets that it seems like the entrance to a fairy-tale castle. The magnificent Gothic Cathedral is the requisite first stop. Be sure to visit the tomb of El Cid, the famed Spanish warrior, and the opulent “Gilded Staircase”, a golden Renaissance staircase that links the nave with a ceremonial door at street level. Also noteworthy are the Constable’s Chapel, a lavishly decorated chapel with a tomb, and the central dome, dubbed “The Crossing” and towering high above El Cid’s tomb. A leisurely visit to this masterpiece could take the better part of the morning. Yet Burgos is more than its Cathedral. Nearby you will find the Casa del Cordón, a 15th-century palace-turned-bank. This is the spot where Isabel and Ferdinand met Columbus after his return from the New World on his second voyage. Also in the area are a wealth of churches bestowed with intricate carvings and sculptures, Renaissance artwork, and gilded altarpieces. There’s no need to visit them all, but you might want to seek out highlights like the 14th-century Iglesia de Nuestra Señora La Antigua de Gamonal (famed for its Moorish-inspired Mudéjar portal) or the 13th-century Gothic Iglesia de San Esteban. Just beyond the city proper are two lovely Carthusian monasteries, the Monasterio de Huelgas, and the Cartuja de Miraflores. 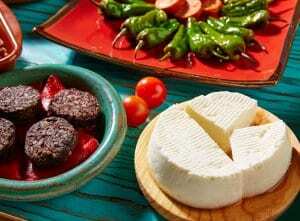 Burgos, like the rest of Castilla y León, is known for its hearty farm cuisine. Lamb is favorite meat, and you will run across delectable creations like roasted lamb head, lamb’s feet stew, grilled lamb kidneys, and the regional specialty suckling lamb. Pork is also popular, whether it’s served as sausage, black pudding or suckling pig. Also, worth looking for are Burgos-Style Soup, made with beef, potatoes and eggs, and kidney bean stew. Nearly any meal can be accompanied by the famous Burgos cheese, a soft white cheese used in salads and served with honey as a dessert. Another wonderful dessert is egg-yolk cake, a sweet soft cake popular throughout the region. The potent red wines of Rioja and Ribera del Duero are the perfect companions for the rich dishes of the region. Burgos’ claim to fame is its majestic Cathedral, a gleaming white Gothic masterpiece built from 1221 to 1795 and considered one of Christendom’s most splendid. On this site, a modest Romanesque church once stood, but today countless ornate spires pierce the skyline. Inside, the highlight is the Escalera Dorada (Gilded Staircase) by Diego de Siloé and El Cid’s tomb. This is by far one of the most spectacular cathedrals in Europe and a “must”. One of the earliest works of Spanish literature is the Cantar de Mío Cid (Song of My Cid), an anonymous epic poem describing the life of El Cid, an 11th-century Christian knight famed for his role in the Christian reconquest of Spain. The warrior was born nearby and lies buried beneath the central dome of the city’s Cathedral. This elegant Cistercian monastery on the edge of the city was founded in 1187 by Eleanor of Aquitaine and still home to 35 Cistercian nuns. East of Burgos sits this 15th-century Carthusian monastery, famous as the burial place of Isabel the Catholic’s parents, Juan II and Isabel of Portugal. The altarpiece, the work of Gil de Siloé, was reputedly made with the first gold brought back from the New World. The river that slices through Burgos is flanked by trees and park-like patches of green. It’s a great place to stroll or rest with a book or journal. Burgos is packed with beautiful churches in Gothic and Romanesque styles. Highlights include the 14th-century Iglesia de Nuestra Señora La Antigua de Gamonal (famed for its Moorish-inspired Mudéjar portal); the 13th-century Gothic Iglesia de San Esteban; the 14th-century Gothic Iglesia de San Gil; and the 16th-century Gothic and Renaissance Iglesia de San Nicolas. A 16th-century city gate adorned with so many towers and turrets that it seems like the entrance to a fairy-tale castle.